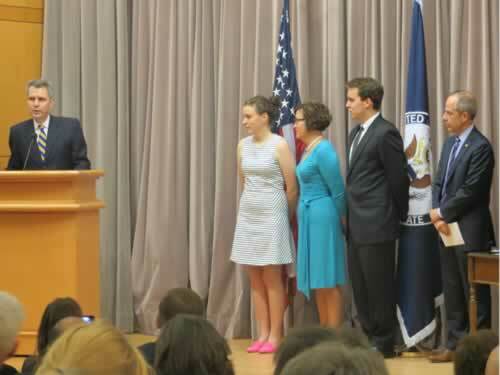 WASHINGTON, DC -- Geoffrey Pyatt of La Jolla, California was sworn in as U.S. Ambassador to Ukraine on July 30 at the U.S. Department of State in Washington, D.C.
U.S. Ambassador to Ukraine, Geoffrey Pyatt, speaks at his swearing-in ceremony, while his daughter, Claire, wife, Mary, and son, William, listen. His Grace Bishop Daniel of Ukraine participated in the ceremony, and the U.S. Deputy Secretary of State William J. Burns administered the oath of office. A Ukrainian Orthodox Church press release stated that there were hundreds of people in attendance, including foreign ambassadors to the United States and various U.S. Ambassadors to foreign nations. The appointment comes after more than 20 years in the U.S. State Department, during which time Pyatt served in countries around the world. According to the State Department, Pyatt was the Principal Deputy Assistant Secretary of the South and Central Asia Affairs Bureau from May 2010 until his recent appointment. Prior to that, he served in Vienna, New Delhi, Hong Kong, Pakistan and Honduras, in various posts within the Foreign Service. Despite unfamiliarity with the Ukrainian territory, Pyatt said he is familiar with its culture. He reports having many Ukrainian friends and working for Under Secretary for Political Affairs Wendy Sherman, whose grandmother is from Pereyaslav-Khmelnitskyi in Ukraine. He said in an interview posted on the U.S. Embassy’s website: “Before I came to Ukraine, I sat down to a wonderful lunch with Ukraine’s Ambassador to the United States, Oleksandr Motsyk. Pyatt said he plans to use social media as a way to sustain an open relationship between the United States and Ukraine. He posted an introductory video on YouTube explaining his goals, which include a video blog and Facebook page. Ambassador Pyatt departed for Ukraine and assumed his new duties on Aug. 3, where he will live for the next three years.